A family beach day in SoCal is only fun if it has some kid-friendly essentials. We’re talking beaches that have lifeguards, clean bathrooms, easy parking and shallow waters to name a few. From Malibu beaches to the surfer studded waters off Manhattan Beach (and even a few in Orange County), we have the low down all things seaside for kids. Read on and see the best kid-friendly beaches in Los Angeles that you should visit with your family next. A bird sanctuary. Surfers to watch. Rocky outliers and sandy swimming spots. Walking distance to the Malibu pier where you can grab lunch at Malibu Farm(one of the best lunches and views in town) or rent poles and go fishing for your own lunch. After you’ve sufficiently grubbed, head to Malibu Country Mart for dessert. Yep, Malibu Lagoon has it all, in one convenient location. Great for young kids who need to constantly be exploring new and different environments, it’s even a perfect place to bring visitors and grandparents, who love to tour the Adamson House, a Spanish Colonial Revival home that has the best surviving examples of decorative ceramic tile produced by Malibu Potteries. Just off Pacific Coast Highway, at Temescal Canyon, Will Roger’s State Beach has a huge sandy beach, volleyball courts, a playground, and convenient parking that stretches the whole length of the beach (extra convenient when you’re toting lots or have very little tots). Parking price vary by season so make sure you hit the ATM before you plan to hit the surf. Speaking of surf, this is a great spot to go practice those boogie boarding skills, with a long and low break perfect for beginners. In need of some sustenance? Gladstones is open nearby, and their kid’s menu is one of the best dining deals by the beach. A visit to the Annenberg Community Beach House is so much more than just a trip to the beach. With a playground, splash pad, pool, restaurant and tons of fun activities planned all summer long, you might not even make it to the ocean. One of our favorite things here is the easy factor: you can reserve a parking spot online so you know the lot won’t be full. You can skip food packing, as Back On The Beach Cafe will provide you with all your snacking and lunchtime needs. And they have the cleanest beach bathrooms we’ve ever seen! Parking rates and activities schedule change throughout the year, so be sure to check their website for updated information before planning your visit. One of the most stunning beaches in all of Southern California, it’s off the beaten path and nicely secluded. The beautiful rock formations (file this spot away to return to for your holiday card picture) give kids places to play and explore. There is a fee to park in the lot or limited free parking on PCH. Insider Tip: There are stairs to take down to the beach, which is OK for even little kids but are not stroller accessible, so strap the babes in a Bjorn. The stairs are part of the fun, and when you get down to this not-too-populated spot, you’ll never want to leave. Just north of this spot is Sycamore Beach, which is another fabulous secret family spot. Good to Know: Due to the Woolsey Fire and recent rains, please check this list of park closures before heading out to one of these beaches or nearby trails. So many things here for the kids to adore: Tidepools! Sea caves! Surfers! And in addition to being far from the maddening crowds, you’re not far from Neptune’s Net — an amazing seafood shack with the added benefit of being a friendly biker hangout. Stop for a late lunch or early dinner on the way home to the delight of your vroom vroom loving kiddos who can try and count all the motorcycles out front. And if you’ve got a pup, the north beach here is one of the few beaches in the county where you won’t have to leave your four-legged friend behind, just don’t forget the leash. Good to Know: Leo Carrillo State Park has reopened Countyline Beach and staircase; however, the campground, backcountry trails and roads, and the day-use area remain closed until further notice due to the damages caused by the Woolsey Fire. Please check the website for up to date information before heading out to this park. 35000 West Pacific Coast Hwy. This lovely stretch of sand is private and picturesque. Often used for filming (you might recognize it in everything from Planet of the Apes to Iron Man), the large cliffs provide a stunning backdrop for your family’s beach day. Hike up the Point Dume path and you may catch a glimpse of body surfing dolphins or climbers repelling the rocky cliff. There is a pay parking lot (closer) or free parking on the street (cheaper). Take note that the lifeguard tower is only manned during peak summer season. End the day at The Sunset Restaurant and you’ll miss PCH traffic too. Tip for little swimmers: This north-facing beach’s surf breaks shallow and close to shore so make sure to keep an extra eye on beginning swimmers at the water’s edge. A surf-free large salt-water lagoon, Seaside boasts lifeguard supervision, playground equipment, a snack bar hosted by Ruby’s, and a large grassy play area. It’s only open in the summer and there is a parking fee of $2/hour ($6 max) along with an entrance fee that varies depending on the season (it’s $6-$8 this summer, and free for the under 2 crowd). If you have a wide age range of kids in your groupm this is a great option thanks to the surf-free lagoon and sand for beach babies and the knock-your-socks-off water slides for your big kahunas. Manhattan Beach is what the rest of the country thinks all of California looks like. Miles and miles of clean white sand, punctuated by a picturesque pier. Try and park near the pier, so you’ll be close to bathrooms and snacks — and the Roundhouse Aquarium, which is located at the end of the pier. This small and intriguing place is free and kids who need a break from the sun and sand love this hands-on aquarium/marine studies lab. Manhattan Beach is also home to some of the best beach volleyball players in the world. So bring a volleyball and let the little ones bat the ball back and forth like the pros do, or just let them watch the big guys play. Because the sight of the refinery up the coast breaks up the pristine ocean views, this beach tends to be less crowded than Manhattan Beach (above). Clean bathrooms, a snack shack right next to the swings, volleyball nets, and a bike path, make it a great place for sports-minded families to spend the whole day. Note: the waves can get bigger here, making it a fun spot to watch surfers. However, since the waves break a little further out, it’s still a very kid friendly surf’s edge. With a name like Mother’s, it has to be good. This is one of the best and safest options if you have small children and you will be the sole grown-up in your gang. Mother’s Beach in Long Beach is on a bay, fully staffed with safety personnel and has a great playground. It can be empty on early summer mornings and a complete zoo on weekend afternoons, so be cautious and crafty when planning your visit. Just a hop, skip, and a jump from Mother’s Beach is the Bay Shore Peninsula. Almost guaranteed to be less crowded, the Bay Shore Beach is clean, safe and fun. If you’re looking for some solitude, try heading farther south down the peninsula where you can probably score a stretch of sand all to yourselves. Just a reminder, there is no surf on the Bayside beaches, so if you have a kiddo who wants to hang ten on the boogie boards, this is not the spot for you. They are, however, perfect for toddlers, beginning swimmers, and parents who are made nervous by big waves. There is free parking on Bay Shore Drive. 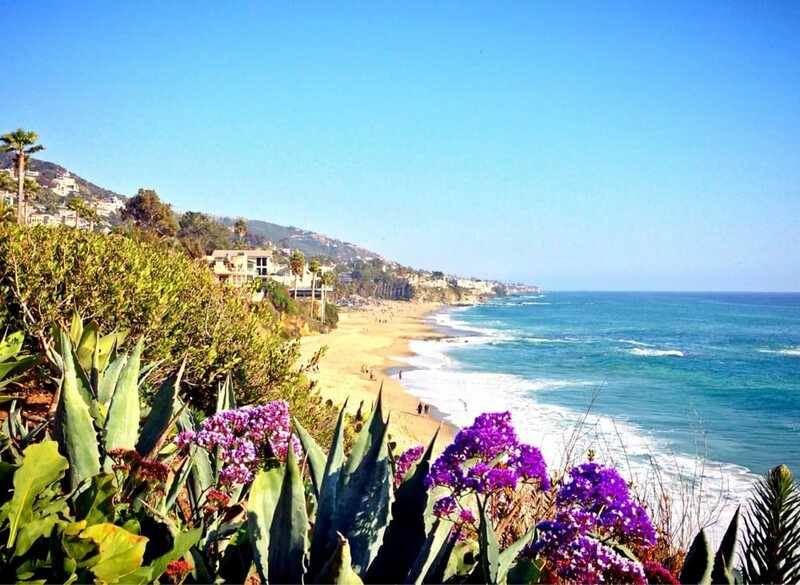 Orange County Beaches: Totally Worth the Drive! Seal Beach: The perfect spot to learn to surf, body board, or bodysurf. Sea Bridge Park, Huntington Beach: Tough to find on your first try, but well worth it. Strands, Dana Point: Puts the “fun” in Funicular! Little Corona, Newport Beach: No steps and kids can watch the divers. Aliso Beach Park, Aliso Viejo: As close to Caribbean blue seas as you get in SoCal. Know Before You Go: Heal the Bay has a very easy to use website that frequently updates all Southern California beach conditions. As of publishing our picks had an A or A+ rating but check before going as conditions can change quickly due to rain and other reasons.